Before graduating to studio films for the remainder of his filmmaking career, Stanley Kubrick cut his teeth on several lean independent films with producer James B. Harris, chief among them was The Killing (1956), a masterful take on Lionel White’s novel Clean Break. Adapted by Kubrick with dialogue written by none other than legendary crime novelist Jim Thompson, The Killing tells a fairly standard tale of a heist gone wrong. However, it is how Kubrick tells it, which makes the film one of the all-time classic film noirs. He rearranges the sequence of events in a way that puts a fascinating spin on how everything goes down, decades before Quentin Tarantino made it cool again with Reservoir Dogs (1992). During the fifth race at a horse track several incidents occur, which are seemingly unrelated to the casual observer but, of course, are all part of a masterful plan as conveyed by the knowing looks between a number of men. Johnny Clay (Hayden) is the de facto mastermind of the job and a savvy crook who understands the odds: “Anytime you take a chance you better be sure the rewards are worth the risk because they can put you away just as fast for a $10 heist as a million dollar job.” He plans to take his cut and fly off with his girlfriend and childhood sweetheart Fay (Gray). Kubrick skips around chronologically to introduce all the significant players in the drama: bartender Mike O’Reilly; track cashier George Peatty (Cook) and his shrewish wife Sherry (Windsor); as well as her lover Val (Edwards); gambler Marvin Unger (Flippen); with two hired hoods – sniper Nikki Arcane (Carey) and brawler Maurice Oboukhoff. Like most heist films, everyone has their own agenda and nobody can be trusted. Kubrick establishes these characters, shows their roles in the job and their respective fates in its aftermath. 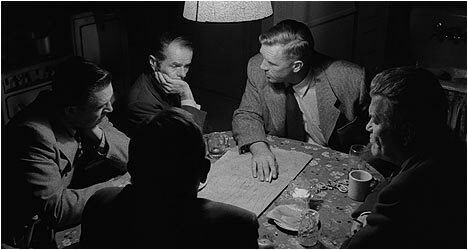 The Killing features an impressive cast with the likes of Sterling Hayden, a veteran of these kinds of films (see The Asphalt Jungle) and ideally-suited as the no-nonsense leader. Idiosyncratic character actor Timothy Carey has a small but memorable role as a grimacing sharpshooter, but it is Elisha Cook and Marie Windsor who steal the show as a deeply dysfunctional couple. She is a two-timing schemer who has her husband wrapped around her finger (or so she thinks) while he’s the proverbial doormat, ignorant of his wife’s duplicitous ways. Some of the film’s best scenes feature their rocky relationship – one that can only end badly. Like most film noirs, The Killing chronicles the inevitable countdown to the doomed finale for all involved. We know it’s coming, we just don’t know how and one of the perverse thrills is watching as everything goes horribly wrong. An early film in his career, Kubrick already demonstrated a masterful touch as he orchestrates a meticulously plotted heist film with the confident hand of a seasoned maestro. He also shows his knack for observing human behavior – in this case that of the criminal mind as he illustrates how a carefully planned job is ruined by greed and jealousy. On the first disc is an interview with producer James B. Harris who talks about working with Stanley Kubrick and, of course, The Killing. Harris recounts how he met the director and the genesis of this film. He gives a nicely detailed account of several aspects of the production and his contributions. Also included are excerpts from a 1984 interview with actor Sterling Hayden for French television. He talks about working in Hollywood and with Kubrick. Quite the colorful character, Hayden is refreshingly candid about his experiences making films. “Polito on Thompson” features Robert Polito, author of Savage Art: A Biography of Jim Thompson, talking about the legendary writer’s relationship with Kubrick and the problems he encountered while working in Hollywood. Kubrick was a great admirer of Thompson’s books, especially his knack for writing dialogue, and wanted to utilize this strength in The Killing. Polito recounts how the two men met and their collaboration on this film. The second disc starts off with a fantastic extra for Kubrick fans – a newly re-mastered transfer of Killer’s Kiss (1955), a low budget film noir the director made prior to The Killing. Shot on the streets of New York City, it concerns a small-time boxer by the name of Davey Gordon (Jamie Smith) who is past his prime. He becomes romantically involved with his neighbor and dancer Gloria Price (Irene Kane) while also getting mixed up with her violent boss Vincent Rapallo (Frank Silvera). Kubrick’s background in documentaries is evident in the way he shoots every day life in New York. The city is almost a character unto itself and the film serves as a fascinating snapshot of a metropolis that no longer exists. Film critic Geoffrey O’Brien talks about Killer’s Kiss. He compares it to a student film in the sense that it was done for very little money, was an opportunity for the young Kubrick to experiment, and demonstrates his promise as an aspiring filmmaker. He points out that there is a loose, almost improvisational quality that would be less evident in later films as Kubrick became a more skillful director.